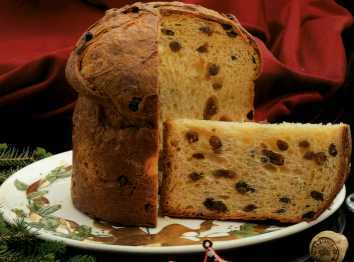 Panettone is a light Italian cake/bread - commonly eaten throughout Italy (especially at Christmas time) with breakfast coffee. In Australia, it is purchased at all good delis - and is considered a delicacy. The following recipe was given to me by a beautiful Italian lady who attended cake-decorating classes with me - roughly 15 years ago - who delighted me with many of her wonderful home-cooked Italian dishes (see other sections of the website for these). Blend 1 teaspoon of the sugar and the yeast into the lukewarm water, then leave aside for about 10 miutes in a warm place until frothy. Beat the egg yolks in a bowl and add the yeast liquid, vanilla essence, lemon rind, salt and remaining sugar. Beat in about 225g of the flour, then gradually beat in the softened butter or margarine about 25g at a time and finally beat in the remaining flour. Turn the dough onto a lightly floured surface and knead well for about 10 minutes until it feels firm and elastic. Place the dough in a lightly oiled polythene bag, and leave aside in a warm place until it has doubled in size. This will take about an hour. Turn the dough out onto a floured surface, punch it down, and knead in the sultanas, raisins and peel. Continue kneading until the fruit is evenly mixed in, then form the dough into a ball and place it in a greased 7 inch deep round cake tin. Cover with the oiled polythene and leave to rise again ina warm place, until it has reached the top of the tin. Brush the top of the loaf with melted butter and bake in the centre of a moderately hot oven (200°C) for about 20 minutes. Reduce the oven temperature to moderate (180°C), brush the top of the loaf again with melted butter, and continue to cook for a furtehr 45 minutes, brushing once more with melted butter after 30 minutes. Remove the Panettone from the oven, turn out onto a wire rack and brush the top and sides with any remaining melted butter. Leave to cool. Serve, cut into thin wedges.